Postscript: Press reports that North Korea launched the Unha rocket this evening were confirmed by US, Japanese and South Korean government sources. At this writing, it is unclear whether the launch was successful although unconfirmed reports have indicated that the rocket flew over Okinawa on its way south. Our analysis stated that the full rocket was on the pad as of December 10 and that all other facilities had completed preparations for the test. But we assumed the Unha first stage would be moved to the assembly building for repairs. That clearly didn’t happen and why remains unclear. More tomorrow. This conclusion is based on a number of considerations. 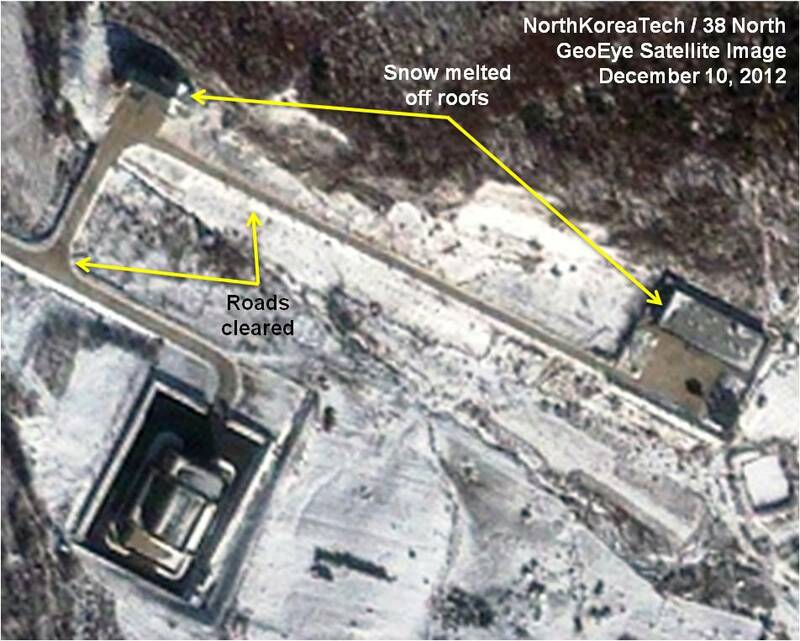 First, imagery taken on December 8 and 10 shows no tracks in the snow on the road between the missile assembly building and the launch pad that would be used by trailers carrying the missile stages. Second, there is no evidence to suggest that the process of moving the stages from the pad to the building had begun before December 10 when the first signs appear, suggesting new activity. 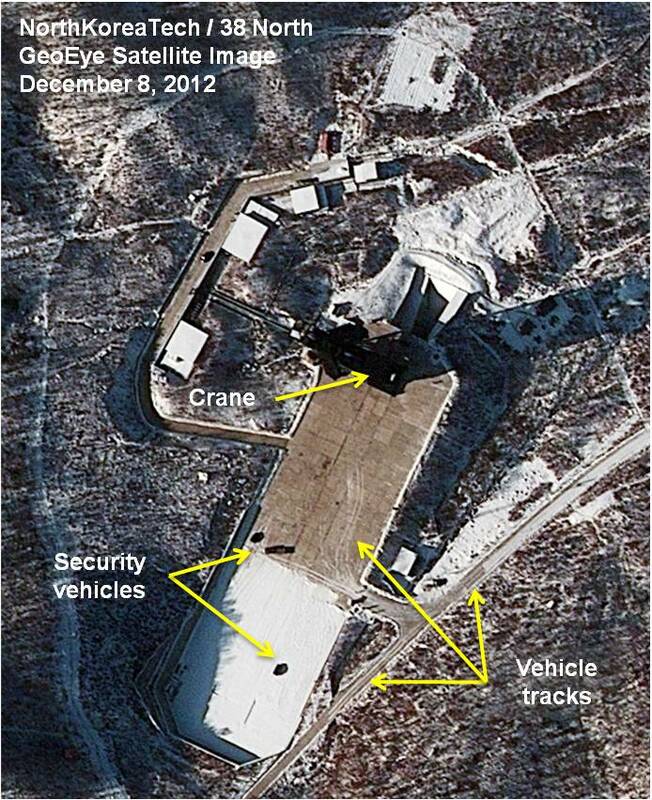 If that is the case, given past North Korean practice, the process of moving the stages to the assembly building likely cannot be completed before December 12-13. A key question is how long it might take for the North Koreans to repair the rocket, move it back to the pad and conduct the test. That effort could take approximately 9-10 days based on what is known about the first stage rocket technology as well as past North Korean behavior. Given that timeline, a launch might take place as early as December 21-22, with added flexibility possible since Pyongyang has extended its launch window until December 29. 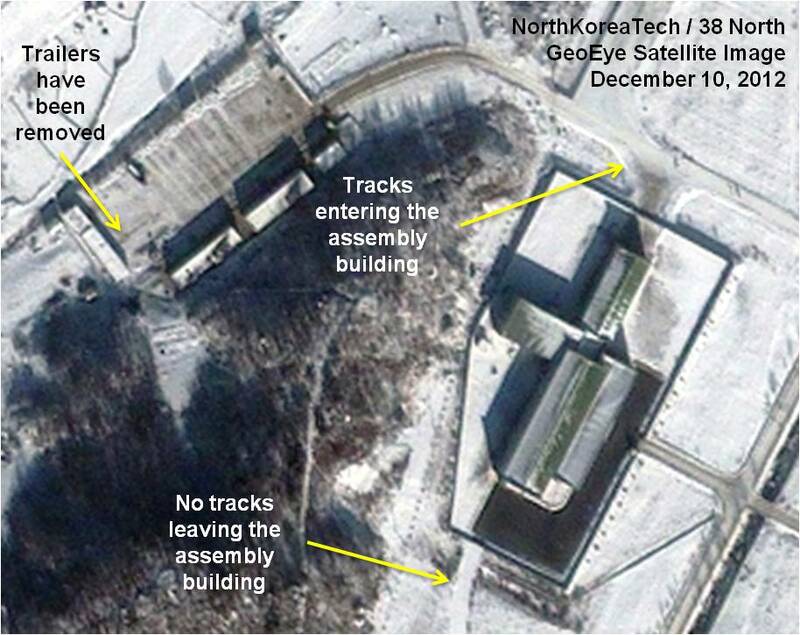 Reports in the South Korean press on December 11 stating that North Korea had moved all three stages of the Unha rocket off the launch pad into a nearby assembly building are inaccurate. While fixing problems with the first stage control engine mechanism will likely require taking down the rocket and either repairing or replacing the first stage, our analysis indicates that process is moving at a slower pace than what has been reported. 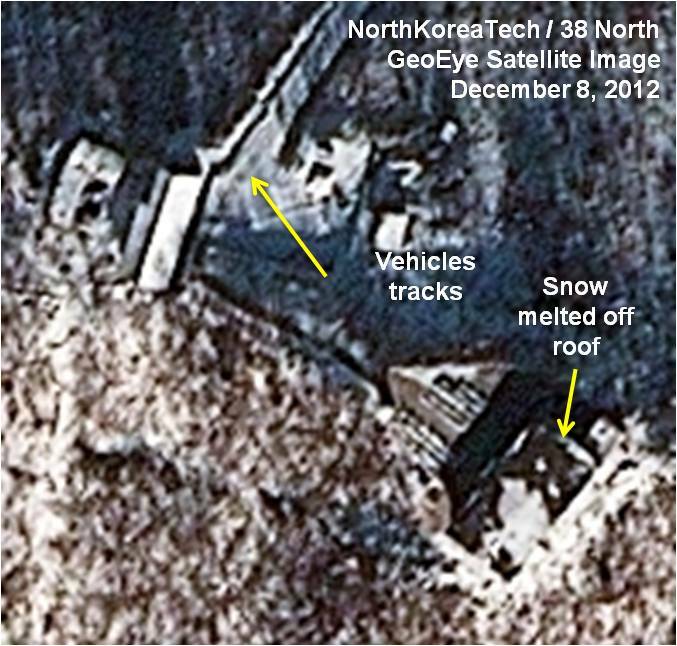 Prior to North Korea’s announcement of technical problems on the 10th, imagery from December 7 and 8 shows that the Unha rocket was likely stacked at the gantry although the covered work platforms make it impossible to say for sure. However, recent satellite imagery from December 10 shows new activity probably related to the removal of the rocket from the launch pad. In the December 8 imagery, there was a low level of activity, perhaps indicating a lull before moving forward with final launch preparations. 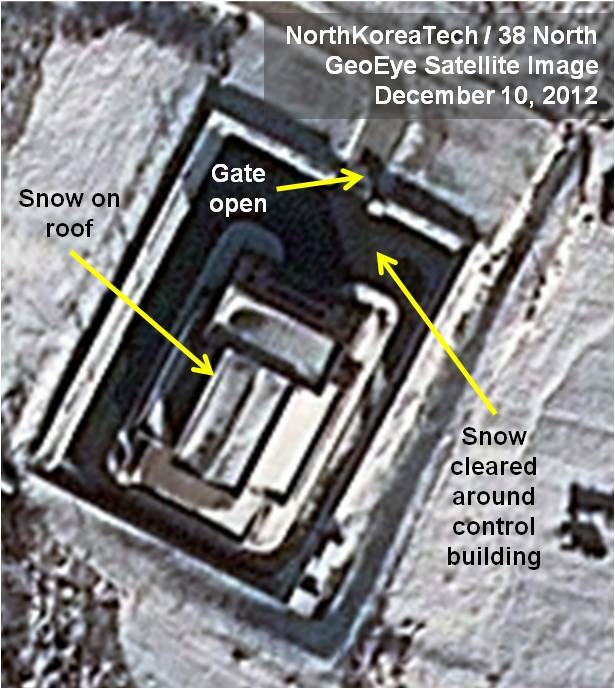 The crane on top of the gantry remained stationary in the same spot both days, only a few small vehicles are present and the North Koreans had begun to clear snow from the launch pad (See figure 1). The road to the assembly building was cleared only part of the way, indicating that they believed it would not be used for heavy vehicles. Figure 1. 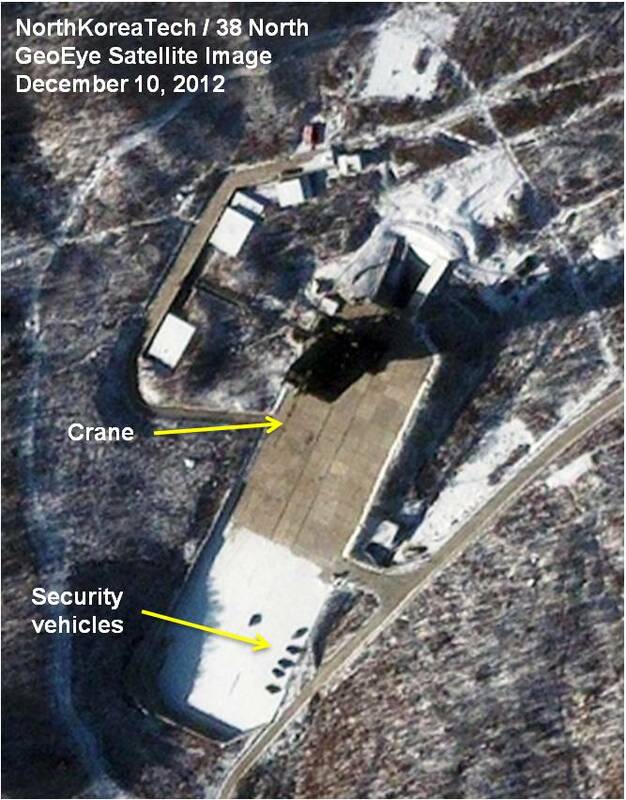 Light activity at the Sohae launch pad on December 8. On December 10, there is new activity probably related to the removal of the rocket from the pad (see figure 2). The crane has moved its position from previous photos and is now on a southern angle along the axis of the pad with work platforms still surrounding the rocket. This indicates that work has been ongoing or is about to begin. Also, small security vehicles are parked in the snow-covered area of the pad. Four of these vehicles had been seen at the pad previously for the stacking of the stages on December 4. Their presence may be related to the December 10 announcement that the launch had been postponed and in preparation for removing the stages. Figure 2. Preparations to remove stages from the pad seem to be underway on December 10. While work may be ongoing or about to begin on December 10, there are no signs that the trailers required to carry the rocket stages have transported them from the pad to the missile assembly building where repairs would be conducted (see figure 3). Imagery taken on December 8 and 10 show no tracks in the snow on the road between the assembly building and the launch pad that would be used by these trailers. 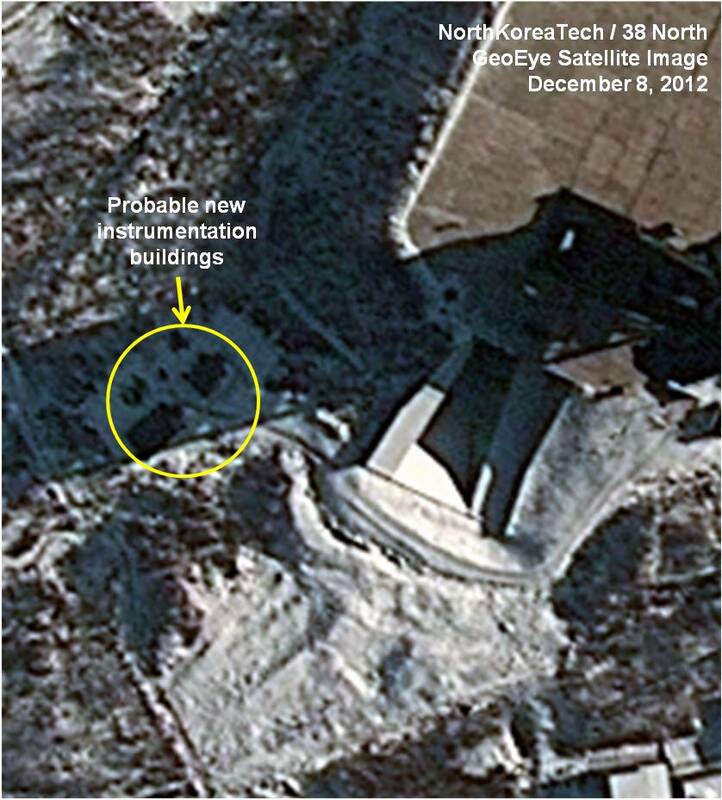 Since imagery taken before the 10th suggested that the process of taking down the stages had not yet begun and moving the stages from the pad to the assembly building would take 2-3 days based on past North Korean practices, we believe that process will not be complete before December 12-13 at the earliest. Figure 3. Trailers to transport the first and second stages are missing, likely inside the assembly building. Pyongyang appears to have completed other preparations for a launch by December 8 according to the imagery. A new development is the presence of two temporary probable instrumentation buildings in the cleared area below the launch pad on the north side near the flame trench (see figure 4). These buildings could house optical instruments used to measure the performance of the first stage’s cluster of four engines that may have been one cause of the failed April launch. Figure 4. New probable instrumentation buildings near launch pad. 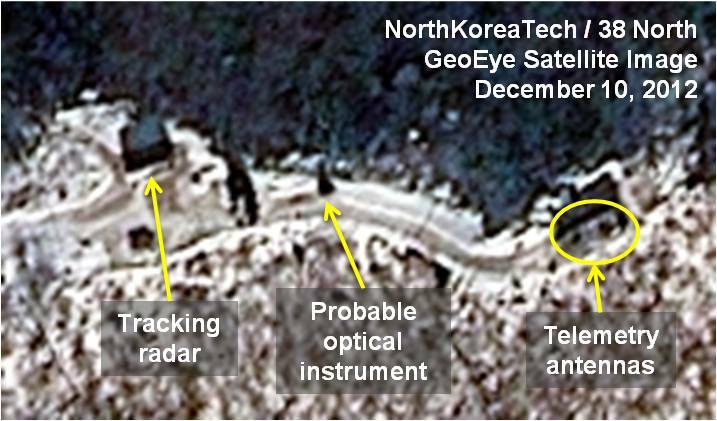 As of December 8, the Sohae instrumentation site appeared fully operational with a tracking radar, two telemetry antennas and a probable optical instrument (see figure 5). The road to the site has been plowed and on the 8th, a bus was parked near the beginning of the road indicating technicians were on site. Figure 5. Instrumentation site appears fully operational. The observation building where cameras are mounted to watch the launch appears operational as well, with vehicle tracks on the road up to the site. The snow had melted partially on the roof of the building indicating it may be heated (see figure 6). Figure 6. Observation building appears operational. At the “VIP hotels,” the snow has been cleared in the parking areas and has melted off the roofs of both buildings, indicating they are heated (see figure 7). Also, the road to these hotels from the rocket assembly building has been cleared down to the concrete, strongly indicating that some VIPs or foreign guests are either already at Sohae or are expected to arrive. Figure 7. VIP hotels seem to be heated, with access roads cleared. While the dark paved area surrounding the launch control building has been cleared of snow and the gate is open as of December 8, the snow has not yet melted off the roof and no vehicles are present inside the fence line (see figure 8). Figure 8. The control building gate has opened. While we cannot be certain, one possibility is that low temperatures at the Sohae test site over the past week have caused the delay in Pyongyang’s planned long-range rocket launch. The problem with the first-stage control engine module cited by the North may have been the result of temperatures at minus 10 degrees centigrade or below that could adversely affect lubricants on the moving rocket components, the consistency of fuel mixtures, or cause the contraction of metals. This is especially the case if a rocket, such as this one, is not designed to compensate for these problems. If the earliest possible date for the rocket to be fully removed from the pad is as we believe December 12-13, repairs or replacement and restacking the rocket on the pad will take at least a week. Pyongyang will then resume its launch preparations and that could still take another 2-3 days to finish, given past practice. Therefore, the Unha rocket may not be ready for launch again until December 21-22 at the earliest. Weather conditions, particularly low temperatures, will continue to be a challenging factor in the run-up to the launch, although the North’s extension of the announced window will continue to give its technicians some flexibility. While forecasting weather over the next 15 days presents problems, it appears that temperatures at the launch site will be problematic beginning December 21. (See Table 1 for weather/temperature forecast.) In addition to adversely affecting rocket performance, low temperatures can also create problems in fueling the rocket, particularly since there is no evidence to suggest that the fuel storage building or pipes leading to the pad at Sohae are heated or that the pipes are insulated. Table 1. Extended weather forecast. Note: Cholsan was selected as the location constant because of its proximity to the observed launch site and forecast availability across multiple weather news organizations. There are limitations that prevent a more comprehensive analysis of the weather forecast’s effects on the impending launch. Across various weather-reporting services, they forecasted similar temperature ranges over the same period of time, but projected different temperatures for each day. Furthermore, the accuracy of any weather forecast typically drops after five to seven days. A light snow fell in the early morning hours of December 3 and a heavier snowfall took place between the afternoons of December 4 and 6. No new snow fell between December 7 and 10.